the enclosed file clc_readme _*-*.txt contains instructions for the use of Wimlib-clc in the respective national language. there is a file repository for wimlib-clc related files. 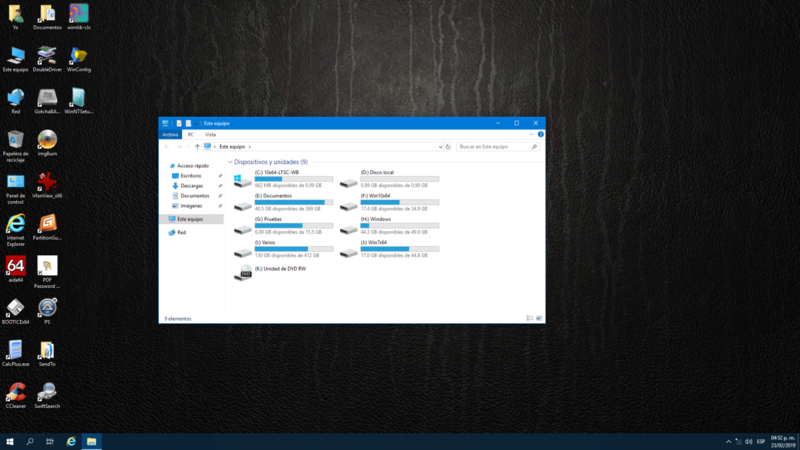 now i think i am getting a better grasp of what the software actually can do : it can backup a windows installation at any given point in time. in so doing, it might as well compact (well, compress) the content to unprecedented compression rates. All this, of course, if I am not mistaken. BTWI, the smaller the slower, or does the compression have no impact on performance? BTWII, can it do the job even in the case of system directories scattered on more than 1 disk, or better still, in the case of some system directories being placed on disks other than c:? Edited by antonino61, 17 October 2018 - 11:31 AM. To use this GUI you need to extract it to a folder (I suggest use wimlib-clc as folder name), preferable to the root of a drive (C:\, D:\, etc.) and download wimlib-imagex x86 or x64 as required (I recommend download v1.13 Beta 5) , links to wimlib-imagex project and download page available on the program Menu under Info, just dowload your required version and make a subfolder x86 or x64 (or both if you want) and put into it libwim-15.dll and wimlib-imagex.exe files respectively, the program will find and use the correct set of files the first time you run it. If you ran before a previous version located on other place, the program could be still pointing to previous location, then on this case on Menu open File >>> Select Program File, and select it on its actual location. For more info on wimlib-clc use you may reed Readme file. this is true, compression stresses the CPU. But you can determine the number of CPU-threads to be used. If I get you right: It can do the job, but not in one step. It can capture from different directories if in "source-list-mode". If I decide to back up the system partition (C drive), can I explicitly exclude/include certain directories/files? That, for me, is a critical feature of any backup/restore software. Use [Extras]-[Install Files to TEMP Dir]-[Install wimscript.ini] -> this will be the config file to exclude certain dirs. Take a look and save as you like. Then select the saved file on [CAPTURE] tab [--config=] to set it as capture option. Tick the checkbox of course. Hope this is the answer you expected. Edited by vigipirate, 15 December 2018 - 05:33 PM. Hello my good friend, hope you are fine. it's been some time since we talk last time, there is an issue on wimlib-clc when capturing Win10 installs as wimboot mode, you can see wimb's post about this here. I can confirm the issue when making Win10 1809 wimboot captures (x86 and x64). Any idea what the purpose of this section is? I don't actually use wimboot compression or compact deployment on my server images, but I do usually capture with the --wimboot flag because its an easy way to exclude logs and temp files etc from my images. It doesn't seem to cause any issues that I can tell, but I am curious to know what this pinning functionality is. 1.- It seems to me the warning can be safely ignored for now, untill Eric Biggers (Syncronicity) gives us more info about the issue. 2.- And (optionally) if we don't want to see the warning anymore we can make our own WimbootCompress.ini not including that section and keep a copy of it in wimlib-clc folder and using it as our config file. Anyway before making any final conclusions and as I allready have 2 VHDs of 10, I'm going to make some wimboot captures of 10 x86 and x64 with original WimbootCompress.ini and the modified version to see if there is any problem in either case and report back ASAP. Anyway final decision will be yours as you are the author, I'm just trying to help with info and ideas. During capture of Win10 on wimboot mode can be safely ignored, not a single problem after capturing 10x64 (1809) as wimboot .wim from a VHD and latter applying it to a new VHD as wimboot install. I don't see a reason to run more tests, since this confirms what Synchronicity said.